When it comes to effective wedding business marketing, it’s either going to cost you MONEY or TIME. 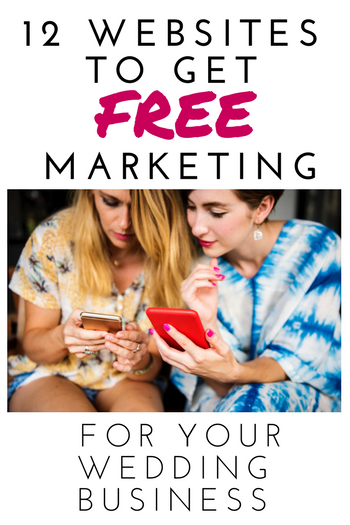 If you find your wedding business gives you a little more time than money on your hands, start using the free marketing power of these websites. They take a little bit of time to set up and use properly for your wedding business, but they’re well worth the effort. WARNING: Some wedding directories on this list restrict businesses by country. Please read each site’s Terms of Service for details. Create a free listing for your US business with a link to your website. Profiles are great for connecting with other wedding vendors, pages are excellent for promoting your business, gathering reviews and attracting bride traffic both on Facebook and in the search engines. This site is a must. 75% of the traffic on Twitter DOES NOT come from Twitter users. What does this mean? Twitter is actually a search engine. Other search engines and aggregating sites pick up those tweets and serve them up for hungry searches. That can equal more website visitors for you. Set up or claim your local business listing on Google and it can be an easy way to get onto Page 1. Optimize with targeted local keyword phrases, add images and contact information and you’ve got easy, free marketing. Even though #10 isn’t a single website, local business directories can be such an effective form of free marketing that I couldn’t resist mentioning them. Create free accounts on any or all of the 50 local business directories in this article. Then don’t forget to search for local wedding directories and get a free listing wherever possible. Free listings for event businesses in the US and Canada, with paid upgrades for more features and visibility. Sign up and get leads for free. You only pay when you choose to respond. US businesses only. Did I miss a free marketing site you can use for your wedding business? Leave me a comment and I’ll add it to the list! Great info! Venues and Vendors can access a free listing at http://www.BeachyBride.com, an interactive site making it easier for couples to plan their beach wedding. This was a great post and super helpful for someone who just getting started as an events & wedding venues! Actually i was looking for such sites and finally i got what I want from this blog. thank you guys for sharing it. Going to start growing my wedding business with them. This was a great post and super helpful for someone like me just getting started as an events photographer! I just love this blog. Actually i was looking for such sites and finally i got what I want from this blog. thank you guys for sharing it with us. If anyone have more sites related to this blog then please send me. Keep up the good work!! thank you for the blog on wedding. it helped me plan for my sister’s wedding. It is the really great and useful article. Keep it continue! Thank you for giving us great resources! We really appreciate your efforts. Thanks for sharing very useful post. Great resource.. can’t wait to try out a few of them for our travel business. Appreciate your efforts..
Wow….Amazing… Its really really very nice list for wedding related sites. I am from Melbourne. I have also best wedding photography Melbourne website to capture your most memorable moment. Great list above. Would love for you to add https://www.wedimage.com/ to your list, or do a review of it. Great article! Would be nice to see more Canadian specific links and listing services, but lots of great info here, thanks! this is a wonderful blog site. shaadielephanti.com Shaadi elephant is a renewed wedding planner in India. We specialize in arranging celebrity wedding. Contact us for your dream wedding arrangement . Stephanie Padovani, it is the really great article. very helpful for me. Thank you for sharing. Thank you for the awesome comment! So glad you found the article useful! Some truly nice and utilitarian info on this website, likewise I think the style and design contains great features. Happy you can use this information. Thanks for the comment! Thank you for giving us great resources! I am going to get busy on posting right now! Excellent article! Thanks for all this info! Thanks for the information. My website weddingsforyoutwo.com has been seeing a lot more traffic since signing up with a few of these platforms. Thank you so much for the opportunty afforded all the struggling artist out there , who are looking for an outlet to get noticed so they can become self reliant and build a business , so as to not rely on corporate america for a hand out. Great article. Get a online appointment booking scheduling software for photographers. Pulse 24/7 is photography appointment booking app, photographer booking software. Brilliant article! Thanks for all this info! Great post, thanks foe sharing! Weddingdetails.com is offering a free listing for all wedding professionals. Go to Vendors in drop down list you will see – submit free listing. Thank You Kindly For All The Suggested Sites! Great Help.. Thanks for the links, I will add my Minneapolis wedding photography business to them. Very Useful list of links. I’ve visited a lots of websites through Google but few of the websites I am not able to find directly so that is very useful list for all vending vendor. Hi, the article is great! Regretfully my website http://www.coordinatecuba.com is a business located in Havana, Cuba and most of the wesites on the list does not include Cuba as a wedding destination. Any advices will be really apreciated! Thank you! I have used your site for multiple posts, and they are all super helpful! My site http://www.uptowneventsomaha.com is fairly new and definitely want to make sure we hit all the applicable sites. We signed up for paid advertising, are there any others you would recommend for paid advertising? Thank you for the helping hand, nice to see a list all in one place. Photographer4u offers a very affordable business lead service. You get a free listing on the site and leads emailed to you. To quote on the leads you just need to pay £9.99 / month. Excellent value compared to other sites. Great ideas. Add your wedding business to local wedding directory will be of more good. And also following them in the twt and fb. Coz they have more visitors to their social media pages, which are brides mostly. If the wedding business is in Canada. Vendors can add their business in our bridal portal http://www.bridewants.ca. It is canadian Wedding Planner and Directory with search engine. This is a great list! I would like to add another site too. We just launched WeddingTasker.com last year. An online marketplace for brides to find vendors of all sort (14 different industries to choose from) within their budget, location and needs. Brides post their needs and vendors respond with proposals to win their business. Its free for brides and vendors to sign up. Thanks for the advice! I just added my site http://www.kandephotobooths.com to a bunch of these suggestions! Great article, thank you so much for the list and for the comments that have led us to other free listing. We have been struggling with quality wedding photography links for our website http://www.lasvegaswedding-photographer.com for nearly a year now and slowly we have been building better links. Just a quick question, it’s not listed here but does theknot.com have any SEO value with their free listing? Hi! I know this is belated, but we launched WedBrilliant last year & it’s another great place for wedding pros to reach potential clients! Our couples post their various bid requests (from a limo to a caterer to a planner) and vendors get to submit bids for free! Let me know if I can provide additional information! Thanks for a wonderful site for vendors! update! http://www.top10weddingsites.com/submit-a-site.html is no longer accepting free listings! http://canada-wedding-dream.com has 2000+ vendor in Ontario Canada. It has feature to search by city. Thank you for the post. I will look into some of these. Nice post.I have a website about wedding videography.To read your I get very good information from this blog.Many many thanks for you to sharing this valuable site.I must check all this sites. For professionals that organize destination weddings and honeymoons, http://www.honeymoonweddingdirectory.com has free listings. THANKS SO MUCH!!!!!! This is awsome. Im on some of the ones you listed but not on most. You will be Blessed for helping out the small guys. I’ll come back and post more if I find any. Fantastic list for small businesses to get started building an online presence and generating leads. Thanks for the great resources. Thank you so much for sharing these websites with us. I will have a good use of the sites. Thanks for this list. Although I’m located in Australia I will definitely check these out. Hi, just wanted to say great article, although not based in the US or UK i am in the Algarve, Portugal, it is still great for me to get my business listed in a lot of the places you recemmended! I am Sweet Treats, offering candy bars and sweet wedding favours to the great weddings in the sun! Bring on 2014! Awesome article and links. I’m wondering though- how would other vendors rate the pro versions of the websites listed? Has anyone upgraded to the pro versions and do you feel the investment was worth it? There’s all these pages to review and rate our work, it’s too bad there isn’t a page for vendors to rate and review the different listing and advertising pages. Thank you so much for submitting this article. We’ve been in business since April 2012 and have grown rather quickly within 19 months. In doing so, we strongly believe there is always more room for improvement and exposure. Thankfully, we’ve been avid users of FB, twitter and Google +, but we can do better. I missed a simple niche that we were missing out on to get more exposure with and reading your article helped light the fire. Thank you again! Wedding Wire is not reachable for many non US or Canadians users, as they restrict access to their website by geographic filters. It looks that wedding bee is a good opportunity to gain some interest for your wedding business, whether you do wedding planning or wedding photography, just try some of the sites above and stick to 2 or 3, doing more is always a question of available time. Thanks to Stephanie for the inspiring article…. Nice list. Saved for later. I just signed up for advertising on The Knot and Wedding Wire. It will be interesting to see how much traffic I get. I’m happy to give my honest opinion once it’s in place in 6-12 months. Feel free to contact me!! I noticed you advertise on the Knot.mis it worth investing in advertising? Awesome resources! Also photographers looking to submit to blogs and magazines have to check out this epic site! Makes submission so easy! You might also want to check out http://localreviewpro.com and http://etrendify.com. They are both free business listings. Good list Stephanie. We’ve just launched Wedding Buzz which is a brand new wedding article and guest posting directory for people in the wedding industry looking to promote their business. This list is defiantly a good one. Lots of good information. I’ve been a wedding vendor for about a year now and have found my niche (since it pretty much only has me and maybe 4 other competitors) hard to advertise. We are a Custom Wedding App development company. If anyone has ideas on promoting a digital wedding product – I’m all ears! Thanks again for the links! I would like to know how to contact you JP! The Destination Wedding & Honeymoon Professionals Directory has free listings available for wedding specialists that provide wedding services. Please stop by! Thanks for this great resource. I’ve been looking everywhere for a comprehensive list of wedding vendor resources, and this is the best one I’ve found. Thanks to all the commenters who have added additional wedding site links too, alot have them have been really helpful as well. Thanks again. Thanks for sharing your great resources. Hi Stephanie, – I own a small label designing and creating couture hand knit / hand crochet / hand embroidered dresses – lace dresses perfect for bridesmaids, mother-of-the-bride, and destination weddings. I was wondering if there is a way to advertise locally, as I find that advertising nationwide yields no specific results, as these dresses need to be seen/touched/tried on in order to fully appreciate the beauty. Are there any wedding/bar mitzvah websites specifically in NY/CT/Westchester area. – Bridal shows, perhaps sponsoring the fashion show. – Private showings at high end boutiques. Perhaps you could partner and have them sell for you. – Venue tastings and open houses. You could host a workshop with bridal fashion tips or partner with a planner who is doing so. Do a Google search for “NYC wedding,” “Westchester wedding,” “Hudson Valley wedding” and other similar terms to see which websites come up. These would be great websites for advertising or even better (and cheaper!) doing a guest blog post in exchange for credit and a link to your site. I am new in this and I need some help in how to advertice, would love to star for free to see how it goes I make unique realistic sugar flowers, take a look and maybe you can give me some help please! thank you ! I’m not sure what free advertising you’re referring to? We don’t offer advertising on this site. This is a list of websites where you can list or promote your business for free, so that’s a good place to start. Hi, Adam. Thanks for sharing this free listing resource. Can you tell me a little more about the benefits of a Wedding Vibe listing? For example, what makes it different from other directory sites, how many unique visits, etc. Then I can add it to the official list in our article. Thanks! Bridal Tweet is NOT free, they will give you 2 months of free trial, but then your credit card will automatically be charged $149.00 per year. You are correct that Bridal Tweet’s preferred vendor listings are NOT free. However, there are plenty of ways to promote yourself with Bridal Tweet for free, no credit card required. I absolutely loved this thought and immediately had the image of a dance floor strewn with those lovely herb salads that we buy these days. Imagine the photographs of the Bride and Groom surrounded by Cilantro (Coriander to the UK reader) and Rocket leaves and those pretty little red beet leaves! Ah…. and the scent of the leaves as they tread them under foot. I’m sure there’s a great song to go with it Jeff! As always this module is full of simple ideas put over very clearly and practically. Thank you so much for reaffirming some of what I’m doing and pointing out some errors as well. I’m looking forward to implementing this (especially the scene with the salad as a key of my wedding albums!!! What a lovely, romantic image! My “dance them through the salad” vision was a different: guests hopping up onto the tables, wading through vats of gooey Caesar salad, wilted croutons and dressing dripping off the bride’s dress. Were this video and Week 4 Part 3 uploaded or encoded differently? I’ve been able to download all the videos successfully except these two. They’re all MP4 but those two won’t open on Quicktime on my Mac. I’d like to avoid downloading another video player if possible. Did anybody else have a problem with this? I double-checked the encoding on the Week 4 Part 1 and Part 3 videos, and it’s standard AVC 264, encoded the same as the others. Are you getting any particular error? Are you using a different computer, or did you have a problem during download? It could be one of those Mac to PC issues, and you might try downloading the problem videos again. If anyone else is having a problem, please let me know and we’ll look into it further. It says that I “May need to install additional software to open this type of file.” All of the downloaded videos work fine except for Week 4 Parts 1 & 3. I already tried downloading them twice but maybe I’ll try again. I can just watch them online if you don’t figure them out. I had hoped to save them all for future reference. I guess the third time was the charm. They downloaded fine this time. Thanks for your response. 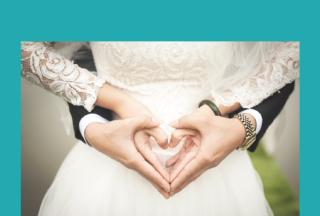 Wedding Connections was founded in 1996 as a wedding resource guide. We have been offering free listings to professional wedding vendors as a way to get in front of the engaged couple. Take a moment and stop by, find yourself in the listings or send us a note and we can add your wedding related business. they list established destination wedding professionals on the site for free but needs to be a member. Great list! Will definitely check these sites. Excellent list. ReceptionHalls.com has been offering free listings for US venues since 1999. Free listings include venue information, website links, photo galleries, menus, customer testimonials and access to real-time statistics and lead information. There is no guarantee of back links from publishers for your Ezine Articles submissions, however there is real benefit from Google as a result.The links are followed and helps rank for your keywords. Google Places is very important if you want page one and you need to encourage clients to leave a review. Great Article – Thanks for the tips! http://www.InclusiveWeddingVenues.com, just launched. It is a searchable directory for Wedding Venues. Wedding venues can sign up online to get listed for Free. Pretty thorough list of links. I’ve visited a few in the past but you’ve offered insight to the potential of a few that I had no idea was available. You also motivated me to clean up my Google Places listing. Thanks! Great list! What are your impressions on how useful the The Knot is with its forums and businesses connecting with brides through their website? The short answer: it really depends. 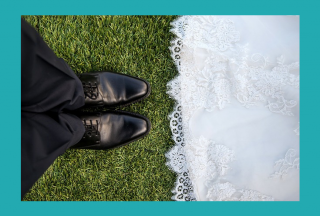 The Knot certainly gets a lot of traffic, but you have to have just the right combination of bride, ad and marketing message to get noticed by the paid advertising. This may change because I hear The Knot is adding reviews, which is what makes Wedding Wire so powerful. The reason The Knot doesn’t make this list is because the advertising there isn’t free. The best FREE marketing on The Knot happens in the chat rooms when brides recommend you, but vendor participation is not allowed. If you do advertise on The Knot, make sure you carefully track your website visitors with Google Analytics to see how it’s working. The Green Bride Guide also offers free listings, if your business qualifies. You must offer carbon-neutral, or eco-friendly products and services.